Calvert Crossing’s scenic views, rolling hills, manicured fairways, and shimmering creeks provide the perfect backdrop for your wedding and special events. Our facility can accommodate groups as large as 300 guests, but it is also perfect for smaller, more intimate gatherings. Along with the beautifully landscaped surroundings, we offer indoor and outdoor event space, numerous photo opportunities for your special day, and some the finest hospitality in the South. Our team is ready to assist you in planning your event just as you have always imagined. They’ll help you select a menu that compliments your style and budget, assist with room selection and dining configurations, and make recommendations regarding the best vendors in and around West Monroe, Louisiana for flowers, wedding cakes, photography, music, and more. At Calvert Crossing, we provide an array of services and amenities which may be included with your special event package and room rental fees. • Set-up and break down • Tables and chairs • China, glassware, and flatware • Table linens and napkins • Inlaid dance floor • Candle votives • Service staff • Tasting session • Vendor recommendations • Ample parking • Special rates on groomsmen & family golf packages On-Course Ceremony Services Mother Nature already provides the picture-perfect backdrop for your outdoor ceremony. We’ll take you on a tour of property and help you select the perfect location based on the size of your event. We’ll make recommendations regarding ceremony set up and provide you with a list of preferred vendors for linens, chairs, wedding trellis, flowers, and more. Picturesque views and serene settings make the perfect venue for your outdoor wedding ceremony. Our private Ballroom is very warm and welcoming and provides the perfect atmosphere for large events. It features ample dining space, natural lighting, a full-size dance floor, and a cozy wood-burning fireplace. 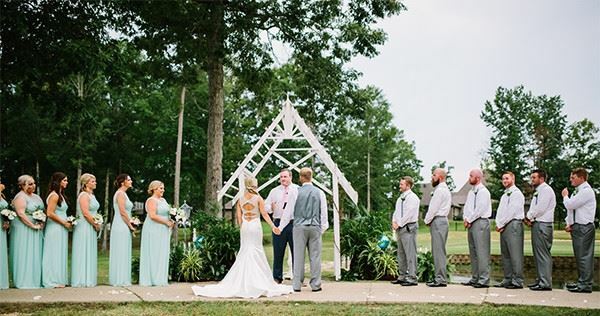 Towering hardwoods, manicured fairways, and picturesque golf course views are just a few elements that provide a beautiful backdrop for your outdoor wedding ceremony. Hosting your ceremony on-course will provide stunning photography and add to your guests’ enjoyment. The adjoining Grille Room offers a casual and quaint setting with a full bar. It is an ideal room to host all types of intimate gatherings like baby showers, birthday parties, bridal showers, and rehearsal dinners. Our adjacent Pool Pavilion which overlooks the golf course is available during the summer season and makes an ideal open-air venue for smaller gatherings and outdoor cocktail receptions. As a full-service, multi-purpose facility, it features a variety of options to suit your meeting needs. Throughout the year many events are held in the Monroe Civic Center, including conventions, trade shows, and other events. The Monroe Civic Center hosts several touring Broadway musicals each year, as well as other productions and concerts.